In which we go for a swim, listen to a big band concert and I get my hair cut for $1 – all before breakfast. Cuba is hot at the moment – 35, 36, 37 degrees and quite humid, which somehow makes it feel hotter. Quite a few holiday makers I've talked to recently aren't particularly enjoying their holidays; I suspect they are trying to do too much in the sort of temperatures where doing nothing in the shade is the best option. You see tourist groups standing in the sun in the square listening to a guide - and it doesn't look fun. Early morning is the best time. So today we headed out down to Punta Gorda as soon as the diesel buses and the horse hoofs woke us up – about 6.30am (we get a lie-in on a Sunday). 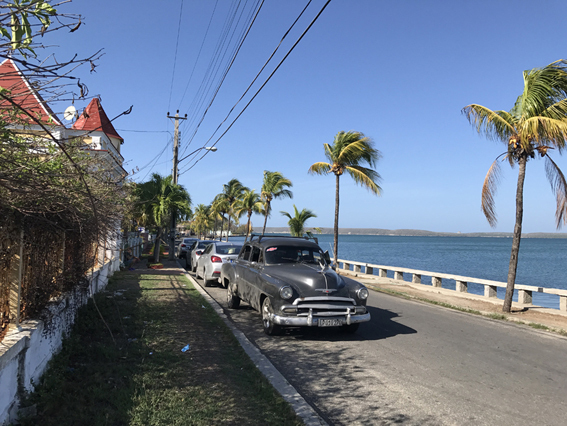 Punta Gorda is the nearest thing to a beach in Cienfuegos – a narrow peninsular jutting out a couple of kilometres from the bottom of the main street, with a couple of small areas of litter-strewn sand. It's where the sugar cane barons built their houses in the 19th century boom times, and there are some fine buildings, including the Cuba-meets-casbah Palacio de Valle and the once-exclusive Club Cienfuegos, which now offers its swimming pool for anyone with 3CUC (the equivalent of 3US$). There is also a pretty house which appears to be made from wooden weatherboards, nostalgic for a New Zealander, until you realise the weatherboards are made from concrete. At the very tip of Punta Gorda is the Parque Recreativo, a small grassy area with benches, a gazebo looking out to sea, and steps you can swim from. There are tables, a churro stall, a cafe selling hamburgers and a small cocktail/beer bar, where last week I had my beloved Star Wars Havaianas jandals/flip flops stolen while I was drinking mojitos – an unexpected robbery in a country which feels pretty safe, certainly safe enough to take one's laptop down to the central square at night. But I digress. At weekends, Punta Gorda park teems with Cienfuegueros drinking beer, eating pulled pork sandwiches and spreading their rubbish over the area, including chucking empty beer and rum bottles into the sea. There is music playing from huge communal speakers, but some groups bring their own sounds too, so it's a cheerful cacophony of Cuban hits old and new. But first thing on a Sunday morning we have the place to ourselves, apart from a lone snorkeler and a grandfather reading his book while his four grandkids go for a swim. It's very pretty and peaceful. On the way back along the sea wall, we look down among the cans and plastic bags and see the rocky shallows team with small fish, many of them in tropical hues. There are ones with stripes, others with bright blue ridges on their backs. The most colourful have a yellow and black fake “eye” towards the tail, which gives the impression they are swimming backwards. Back in town and a big band is in full swing in the Prado, the 4km-long Parisian-inspired main street, which has a wide strip of park in the middle, complete with trees and benches. There are probably 40 instrumentalists – woodwind, brass and percussion - and they make a fine sound. The trumpet players are particularly good. Buena Vista Social Club eat your heart out. There are plenty of people out to listen - the lucky few get seats on benches in the shade, the others perch on the far side of the road, shaded by the covered walkways. It's only 9.30am, but it's already too hot to be in the sun. I've been needing a haircut for a while – it being almost two months since we left New Zealand. But I've been nervous to venture into a Cuban salon, worried in a vain fashion about what I might end up looking like. I have had some bad experiences in the past when poor language skills meet hairdressers' scissors. But watching the concert I spot a woman on a bench in front of me with a very smart Judi Dench trim – just what I want. Summoning up my best Spanish, I compliment her on her coiffure and venture to ask where she gets her hair cut. Isabel turns out to be 71, and very stylish in her dress sense, which is not that easy in shopping-deficient Cuba, where the flaunt-your-luxuriant-curves-in tight-fitting-lycra is the main local fashion. Once the concert is over, Isabel takes me in hand, accompanying me to “her” salon, a large state-run establishment promising total hair and beauty treatments - although there appears to be just one hairdresser on this Sunday morning. With my hair salty from my swim, no make-up and my post-early morning swim clothes still slightly damp, I shamefacedly take my place in the queue, and Isabel stays with me to organise my cut. I don't quite look like Judi Dench – perhaps she has a bit more curl in her hair - but I am happy with the outcome. And the asking price is 5 local pesos – about 20 US cents. I give a tourist peso (1$US) so we are all quite content. An perfectly acceptable haircut and a couple of very cute kids!